Music to titillate tapping toes, young and old alike! 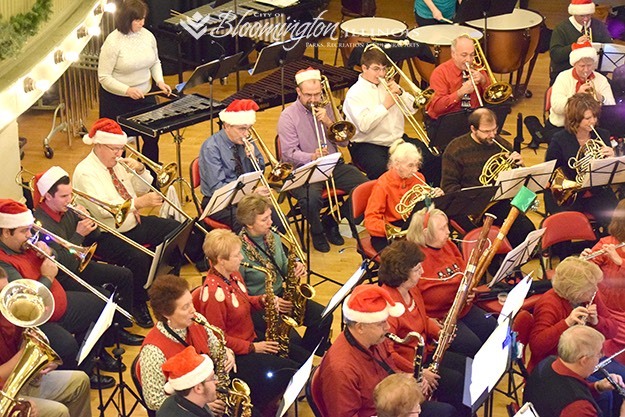 The Bloomington-Normal Community Concert Band (CCB) performs a variety of concerts throughout the year around Central Illinois. From concerts Miller Park, Wesley Methodist Church, and Westminster Village, to the every-Thursday-night summer concerts in Franklin Park, to parade appearances for events in places around central Illinois. Volunteer musicians providing free concerts to the local community. The band has around 70 volunteer members from the Central Illinois area. The B-N Community Concert Band is sponsored by the Bloomington Parks and Recreation Department. We are always looking for new members. Just show up at a rehearsal and bring your horn or your sticks (we do have our own percussion gear). 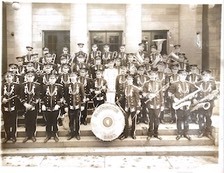 Bloomington-Normal has had a community or municipal band for over a 100 years. The photo is from around 1915—best guess. If anyone recognizes anyone in this photo, the date it was taken, or the location, please contact the band. See comments submitted on the historical photo. Materials on this web site may not be reproduced in electronic or any other form without expressed written permission from the CCB Board.